If you have skin excess of the upper arms secondary to weight loss, aging or genetics, you may be a candidate for upper arm lift or brachioplasty. Brachioplasty is intended to reduce or eliminate excess skin from the upper arms. Upper arm lift is usually done under general anesthesia. In order to remove the unwanted skin, an incision is required that runs from near the elbow into the armpit. The incision is placed in the most inconspicuous location (inner arm toward the back), but some scarring will always be visible. Some patients who are undergoing upper arm lift may require liposuction of the upper arms to get a better contour. If there is minimal skin excess and the patient has good skin quality, liposuction may also be performed alone. Weight loss patients that have reached their ideal body weight usually do not require liposuction. Those with excess skin that may not retract to its normal size because of their age and degree of stretch, may require brachioplasty and liposuction in combination. 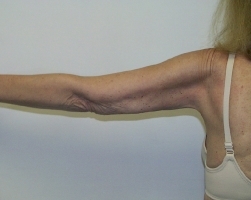 After brachioplasty surgery, the upper arms are placed in an elastic sleeve garment to reduce swelling. Initial healing occurs in 10 to 14 days. The sutures are removed within nine to eleven days. Swelling and bruising gradually disappear over 3 to 4 weeks depending on your skin an the amount of liposuction performed. The majority of the swelling is gone in 3 to 6 months. The scars fade in 6 to 12 months depending on your skin type. Upper arm lift is considered cosmetic and therefore is not covered by insurance. The patient is responsible for the payment. The specific risks and suitability of brachioplasty for a given individual can be determined only at the time of consultation. All surgical procedures have some degree of risk. Minor complications that do not affect the outcome occur occasionally. Major complications are unusual. You may be a candidate for liposuction of the arms if you have excess subcutaneous fat in the upper arms which is resistant to diet and exercise. Most patients are at or near their normal weight and desire change in the contour of their arms or liposculpture. Improved techniques such as ultrasonic and power assisted liposuction allow for larger amounts of fat removal with less down time. The tumescent technique, or filling the area that will undergo liposuction with fluid prior to suctioning fat, has allowed for less blood loss, less bruising, and therefore a faster recovery. 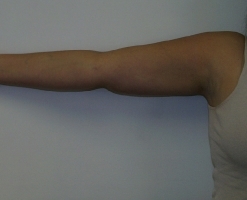 Liposuction of the arms is intended to produce a permanent improvement in the contour and proportion of the arm. A more flattering shape to the arm out of clothing is another goal of liposculpture. Liposuction is done on an outpatient basis. General anesthesia is used for safety and comfort. Small suction tubes (cannulas) are inserted through very small incisions at the elbow and armpit area where they will be inconspicuous. Fat is then removed by applying suction to the cannula. The patients goes home with a compression sleeve garment covering the treated ares. Compression is advised for about a month to reduce the swelling and to promote skin shrinkage and contouring. Initial discomfort is controlled with oral medication. Bruising and swelling usually subside in 2 to 4 weeks. The final result takes shape over 2 to 3 months. Arm liposuction is considered cosmetic and therefore is not covered by insurance. The patient is responsible for payment. The specific risks and suitability of arm liposuction for a given individual can be determined only at the time of consultation. All surgical procedures have some degree of risk. Minor complications that do not affect the outcome occur occasionally. Major complications are unusual. 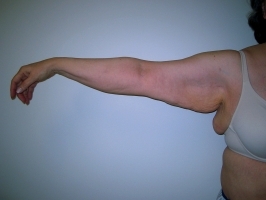 Excess skin of the arm extending into the axilla (armpit) and onto the lateral chest wall can be addressed at the same time with extension of the traditional brachioplasty scar from elbow to armpit further onto the lateral chest wall. 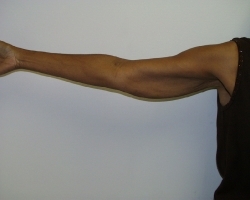 Risks, benefits and recovery of this procedure are similar to those of traditional brachioplasty (above) but operative time is longer. To find out more about these procedures, please call Dr. Lynch to schedule your consultation.